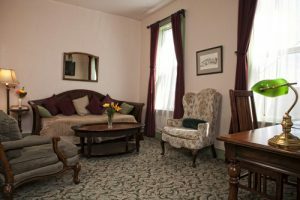 Rooms 1-4 are located over the Spirit Room Bar, and may be noisy, especially on weekends. 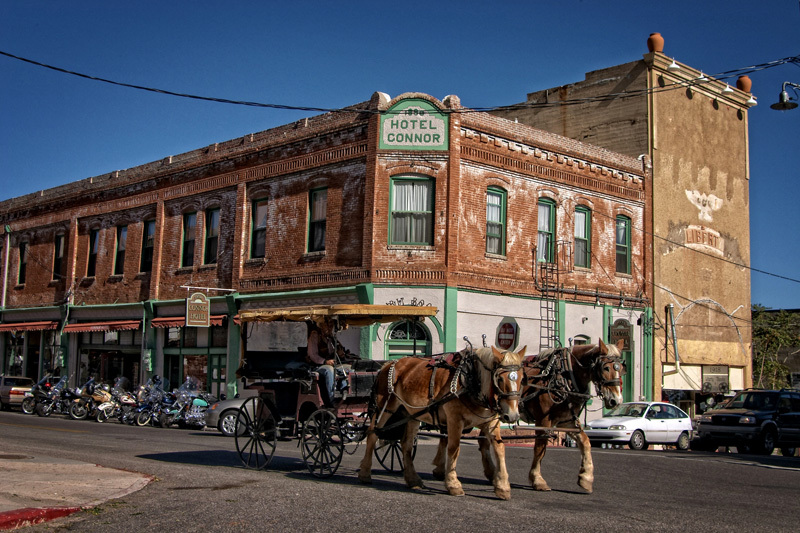 The peak seasons for visitors in Jerome are Spring and Fall. We're offering $20 off the price of your room when you book Sunday through Thursday. This offer does not include Memorial and Labor day weekends. 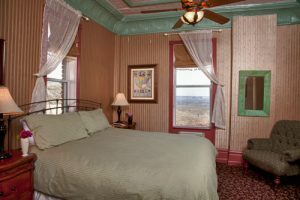 The Historic Connor Hotel in Jerome Arizona boasts some beautiful rooms. 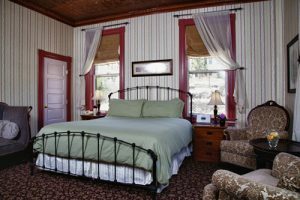 Whether this is your first stay in Jerome or you are a frequent visitor, we have the room that is just right for your stay in the Historic town of Jerome. 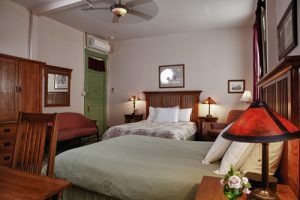 We offer a variety of rooms and layouts that will accomodate families, friends travelling together, couples, you name it! 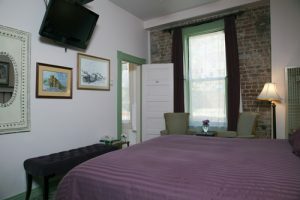 Take a peek at what we have to offer and book your perfect room today! Most guests will agree that Room 1 is extra special. 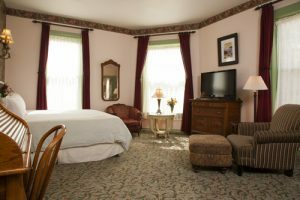 A spacious, elegant corner chamber, its oversized windows offer a bird's-eye view of the town park and downtown Jerome. One king bed, a bar sink in the room, and a tub/shower combo. 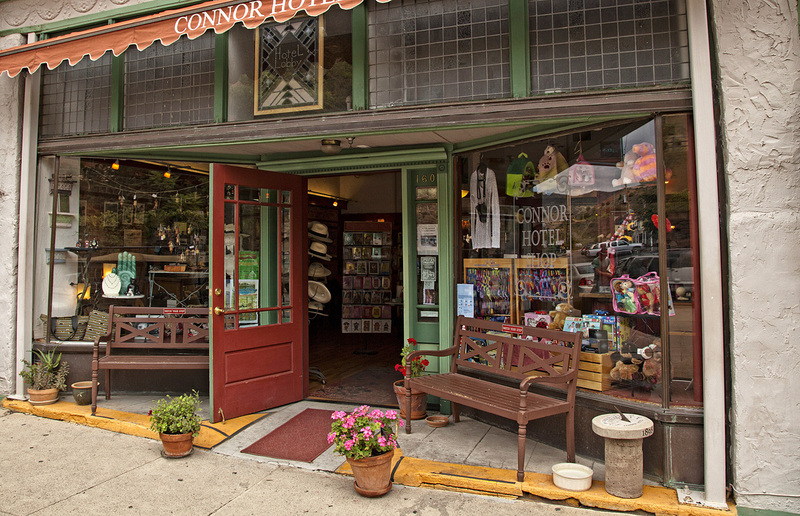 The peak seasons for visitors in Jerome are Spring and Fall. We're offering $20 off the price of your room when you book Sunday through Thursday. This offer does not include Memorial and Labor day weekends. 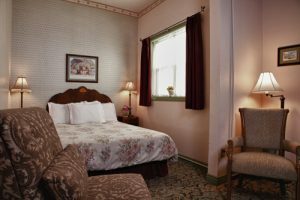 This two room suite is ideal for families or travelers wanting a bit of extra space to stretch out. 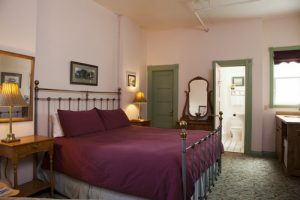 The bedroom features a king bed and a large vaulted skylight. 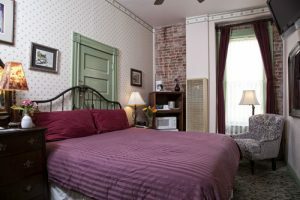 The sitting room has two large windows overlooking Jerome Avenue, and is comfortably furnished with a daybed with trundle (can be made up as two twin beds), easy chair, desk and bar sink. Tub/shower combo in the bathroom. Cozy and quaint describes this getaway. 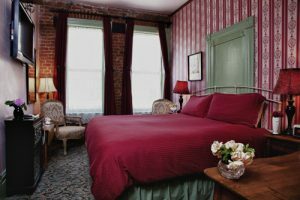 Its original wallpaper, brickwork and two windows overlooking Main Street view will take you back in time. One king bed, tub/shower combo. All the comforts of home on a small scale. Original exposed brick wall and Main Street view window, with great dark wood antiques. One king bed, tub/shower combo. Original exposed brickwork and a lovely, bright bathroom make this room welcoming and delightful, with its perch above Main Street. One of our most spacious rooms, Room 6 even has a bathroom almost large enough to throw a party in (but please, don’t get any ideas). Main Street views abound, both from the bedroom and the bathroom. Make yourself at home and stay awhile! Two queen beds, shower only. Fabulous and elegant might sound extreme, but wait until you see this spacious corner room! Vintage tin ceiling, gas "woodstove" for cozy ambiance, big flat panel TV, and a bathroom to die for, complete with oversized whirlpool tub. 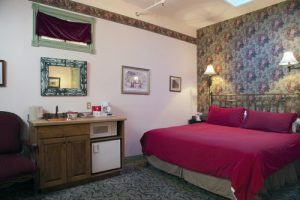 Tucked away in a quiet corner at the back of the building, Room 8 offers a view of the Verde Valley, Sedona’s Red Rocks, and the San Francisco Peaks. One king bed, bar sink, tub/shower combo. Flooded with light by the original vaulted skylight, Room 9 is a delightful retreat. Vintage wallpaper accents complete the effect. King bed, bar sink, tub/shower combo. This quiet hideaway is comfortably furnished with lovely antiques, including a wonderful 1930s dresser with a huge round mirror. One queen bed, tub/shower combo. Room 11 features an oversized, original window onto its own light well, which gives the room lots of light without sacrificing privacy. Oak antiques and rose wallpaper set the tone. One queen bed, shower only. Did anyone say views? and more views? This corner hideout has it all - red rock and mountain vistas, absolute privacy, seclusion, and over-the-top luxurious amenities. 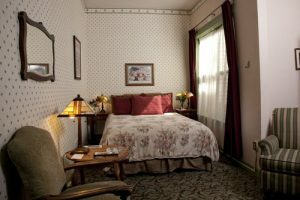 From the flat panel television to the original tin ceiling, gas-fired wood stove, and large whirlpool tub, you will think you've found your own little kingdom.